When I walk along the green Belgrade streets past numerous kafans and restaurants (there are ten times more per capita than there are in Moscow), I exist surrounded by many seductive scents. The most powerful and disturbing one is the smell of freshly ground coffee. Slightly weaker, but the aroma of roasted paprika and fresh bread is also very clearly heard. A special, unique melody in this symphony of smells is the aroma of roasted meat on roshtil. The most popular Serbian dishes on the Roshtil are chopped pleskavitsa steak and sausages made from minced meat kevapchichi. Analogues of these dishes are easy to find in Croatian, Slovenian, Bulgarian and Turkish cuisine. By the way, the name «chevapchichi» in Serbia is often shortened to «chevapa», and from it, as philologists believe, is already within reach of the Turkish «kebab». However, we leave to philologists interesting, but tasteless (in the most direct sense of the word) philological theories and return to cooking. Options pleskavitsy there are many, they differ only in details, however, sometimes not unimportant. In short, the recipe of this dish is as follows. Equal parts of beef and pork are taken, they are made into minced meat, finely chopped onions, pepper and salt are added to it. They make cakes from minced meat, which are then roasted on a wire rack. It would seem nothing special. But this is only the basis, which looks, in general, ordinary. In addition to hot peppers, minced lard, one or two crushed cloves of garlic are added to the mincemeat, and they serve, watering the finished sprinkler with heated kaymak. Kaymak — it is slightly salted foam, taken from freshly cooked baked cow or sheep milk. Kaymak has a very delicate, slightly salty creamy taste. It is added to many dishes, served as a snack, as well as spread on bread. The slightly fermented kaymak tastes sharper than freshly prepared; more salt is usually added to it. Kaimak is incredibly popular in Serbia. Very often, the housewives do it themselves. Pleskavitsu they cook not only in cafes and restaurants, but also in tents working in the fast food mode. In the “street” version, the splash is an impressively sized burger, which, in addition to the loaf and the splash, includes pickled cucumbers, sweet mustard, ketchup or mayonnaise (all at once or to choose). In this embodiment, the plezkavitsa, of course, tastier and more satisfying than any big poppy. By the way, I didn’t remember about a big Mac. In the late 80s of the last century, only one McDonald’s restaurant worked in Belgrade, and the residents of Belgrade treated him, to put it mildly, coolly: they considered the establishment as overseas exotic and didn’t bring down the shaft. Then it seemed that the national «catering» does not leave a competitor from the New World a big chance. But times have changed: there are already nine McDonald’s in Belgrade today. Per half a million citizens is a lot. Chevapchichi (accent on the second syllable) are popular in Serbia as well as the splashes. These are sausages, which are usually served in restaurants, laying down on a slide on large heated dishes. For cooking cevapchichi better to take different parts of the beef: neck, brisket, scapula, flank. Meat is twice passed through a meat grinder, salted, pepper and thoroughly kneaded, and then flat sausages are formed, 2-3 cm long and 5 cm thick. They are smeared with vegetable oil and baked on roshtil until ready. 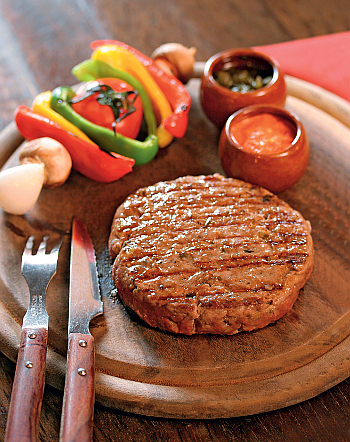 Garnished with cevapcici is chopped onion rings, sweet pepper salad with tomatoes or fried potatoes. In Serbia, other dishes cooked over charcoal are common. For example, razhnichi — the so-called kebab is called here (pieces of meat on a skewer are usually alternated with slices of paprika) and generally everything that is fried on a skewer: for example, grilled ground beef balls are also ražnichi. And in Serbia there is an interesting recipe for pickled paprika. Paprika in Serbia is called sweet pepper. Eating it in the Balkans is probably as much and often as we have potatoes. In any case, closer to the fall in Belgrade, peppers are bought in the markets for home-made blanks with bags — without any exaggeration. Feature snacks «Pechen paprika«- in that pepper is first baked and only then marinated. It is best to bake it on a roshtil, although they do it in the oven and on the coals in foil. Serbia even sells special electric ovens specifically designed for roasting peppers. The recipe for a marinade for baked pepper varies depending on the tastes of a particular chef: someone loves a bit sharper, someone likes to put a lot of garlic in the dishes. These and other dishes of the local cuisine are best tasted, of course, in Serbia (since the so-called «Serbian» restaurants in Moscow do not always cook in Serbian). You should not order Splashgow and Chevapcici in some trendy restaurant, it is better to find a small Kafan in Belgrade — for example, in the Old Town area, on Skadar Street. The aroma of grilled meat and paprika will inevitably call you inside. If you find yourself in Belgrade in the winter and feel the breath of the damp and cold wind from the mountain passes (it is called «Koshava»), the desire to dive into the Kathan will become completely insurmountable. Sit at the table and ask the waiter for a menu of home cooking (jelovnik domaće kuhinje) and order something from the roshtil ( Jela sa roštilja ). This will be the true taste of the Serbian grill.